Two recent cases of pink salmon being found in Newfoundland and Labrador rivers are not a reason for panic, says the Atlantic Salmon Federation. Two recent cases of pink salmon being found in Newfoundland and Labrador rivers are most likely the result of a stocking program — just not one on this continent. Instead, the pink salmon likely came across the Atlantic from Russia, according to Steve Sutton of the Atlantic Salmon Federation (ASF). CBC was sent a photo of a pink salmon that was caught in the Gander River last week, and Sutton says another was caught two weeks earlier in Cartwright, Labrador. Pink salmon are native to regions around the Pacific Ocean and are rarely seen in this part of the world. 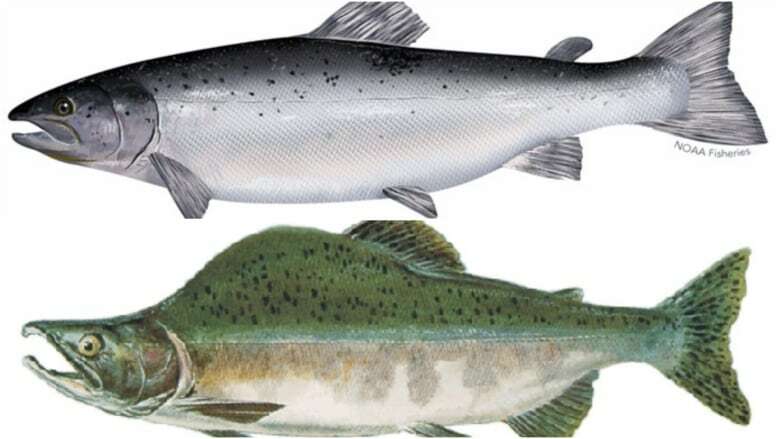 They are distinguishable from Atlantic salmon because of their greenish colour and the fact that adult males have a large hump on their bodies not seen with their Atlantic cousins. Sutton told CBC that there was an attempt to introduce pink salmon in the province back in the 1960s in North Harbour River in St. Mary's Bay. The fish didn't really take and none were ever reported being caught after the program was terminated more than 40 years ago, so he doesn't think these salmon are connected to that. The more likely origin of the fish? The Russians. "There was also a stocking program to transplant these pink salmon into some rivers in northern Russia starting in the late 1950s and running right through until about 2001," Sutton said. "The fish there apparently did take and this year we understand there's been an explosion of them." 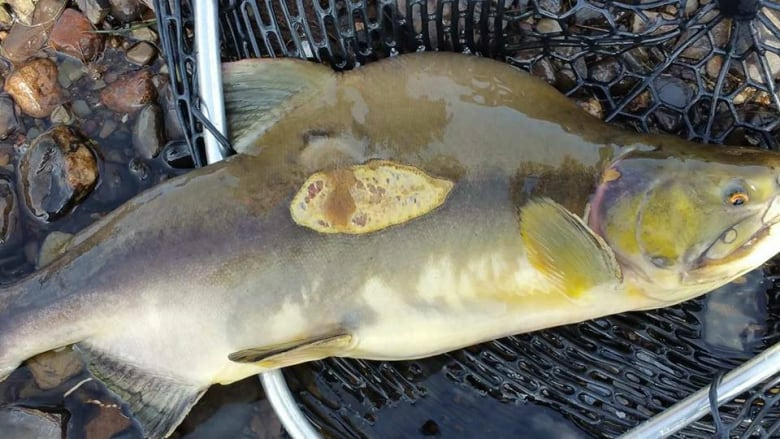 Pink salmon from Russia have been reported in Scotland, Ireland and other parts of Europe over the last year or so, Sutton said, and have raised concerns that they could become established and displace other fish species. 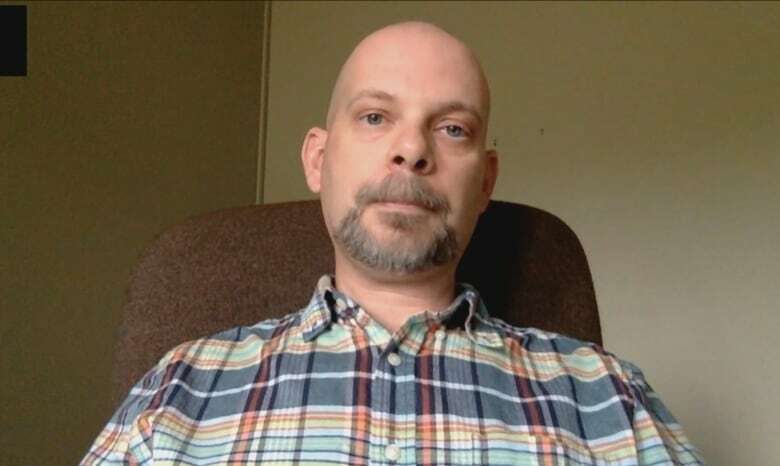 He said it's very possible that some swam across the Atlantic into Newfoundland and Labrador waters. "They are a migratory species, and when they get into the Pacific Ocean they migrate," he said. "So when they're in the Atlantic they're not sure where they're going so they're getting out there and swimming." Sutton said while groups like ASF and Fisheries and Oceans Canada are closely watching the situation, there isn't too much concern right now that pink salmon will disrupt the ecosystem around Newfoundland and Labrador because of the different conditions that Pacific Salmon and Atlantic Salmon require. He asks anyone who sees a pink salmon to report it to DFO so that researchers can keep track of what's going on. "I don't think we should panic, this is the first time we've seen them in a long time," he said. "We have tried to introduce them into Newfoundland before and it didn't work."